kt literary » Blog Archive » A Second Star for RED BUTTERFLY! 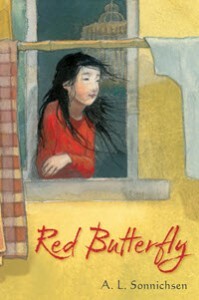 A Second Star for RED BUTTERFLY! Evocative first-person poems divided into three sections—“Crawl,” “Dissolve,” and “Fly”—combine with small, delicate b&w illustrations from Bates to provide a framework that helps organize the chaotic feelings 11-year-old Kara struggles to express. Mysteries pervade her life: although ethnically Chinese, she lives in China in near poverty with her Caucasian mother, hiding her misshapen right hand in long sleeves, speaking English at home, unable to attend school. Mama promises that someday they will live with Kara’s father in Montana, but for now: “Don’t ask me,/ Kara,/ don’t ask me.” Piecing together her story, Kara realizes Mama discovered her, an abandoned baby, and stayed in China illegally to raise her. After this transgression is discovered, Kara finds herself in an orphanage as her Montana parents vie with another family to adopt her. Sonnichsen creates a palpable sense of yearning for home and belonging (“I want to explain, but/ I can’t make my mouth form words./ How a place so beautiful/ can make me feel so sad”) in this heartbreaking, heartwarming, and impressive debut. The book goes on sale in January! Congratulations, Amy! RED BUTTERFLY is on a roll.